" We get an award as the regional government that implemented the best gratification control system by KPK"
Jakarta Provincial Government gets an award as the regional government that implemented the best gratification control system from the Corruption Eradication Commission (KPK). 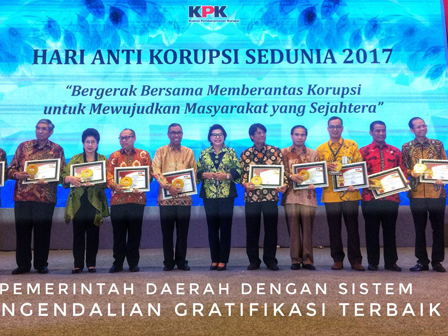 Jakarta Inspectorate Chairman, Zainal disclosed the award was given, as the city consistently reported various gratuities acceptance. Since 2014, they have established a Gratification Control Unit (UPG). "We get an award as the regional government that implemented the best gratification control system by KPK," he stated, at City Hall, Wednesday (12/13). His party has gratification control team, either it is at provincial or city level. "This team is responsible for receiving, researching and forwarding to the KPK on gratification reports," he said.